senseFly, the world’s leading producer of mapping drones, introduced a new line of comprehensive senseFly 360 solutions, tailored to the surveying, mining and quarries, inspection and agriculture sectors at INTERGEO 2017.
and professional, industry-focused image processing and analysis solutions from either Pix4Dor Airware – depending on the solution. 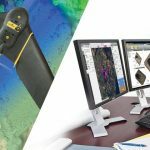 In addition, senseFly 360 solutions include full access to educational materials as well as lifetime professional grade hardware and eMotion support. senseFly Survey 360– a complete aerial mapping system, capable of producing survey-grade data outputs. senseFly Mine & Quarry 360– a complete aerial site analysis system that provides detailed insights required to improve site and inventory management, provide quick, as well as accurate reporting. senseFly Inspection 360– a complete aerial inspection system that produces timely, geo-accurate data outputs. senseFly Ag 360– a complete aerial crop analysis system that drives accurate decision making, for a better quality crop, higher yields and greater profits. “senseFly 360 solutions provide geospatial professionals with market-proven, ready-to-deploy solutions that cover the whole data collection process—from flight planning to the generation of highly accurate data products and expert support. Most importantly, as we know from the feedback of senseFly operators around the world, these solutions provide a positive return on investment through helping organisations to boost their efficiency by rapidly reducing their data collection times” said Jean-Thomas Celette (Chief Sales & Marketing Officer at senseFly).